BEFORE: Settled garage floor prior to the slabjacking process. 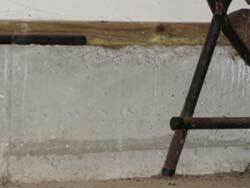 There is a noticeable gap between the floor and the "pour line" against the foundation wall. Project located in Massachusetts. AFTER: Garage Floor after slabjacking. The slab was raised approximately three inches. The work took less than a single day. 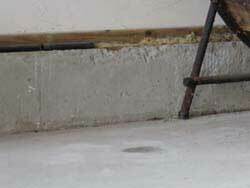 Sunken garage floor slabs can lead to a host of problems. Uneven and sunken areas are eyesores that reduce the functionality of the garage space. Water can drain in the wrong direction and pool within the garage. This water can then possibly erode soil out from underneath, making the problem even worse. Slabjacking is a specialty process for raising concrete slabs. In essence, penny-sized holes are drilled in the floor through which a high-tech urethane foam is injected. This expanding foam can rapidly lift a slab from below and can support heavy equipment just minutes after injection. Floors can be rapidly lifted with minimal disruption. The process provides a clean and minimally invasive means of repairing sunken floors and is especially useful for interior applications. Contact us to see how can help with your project.